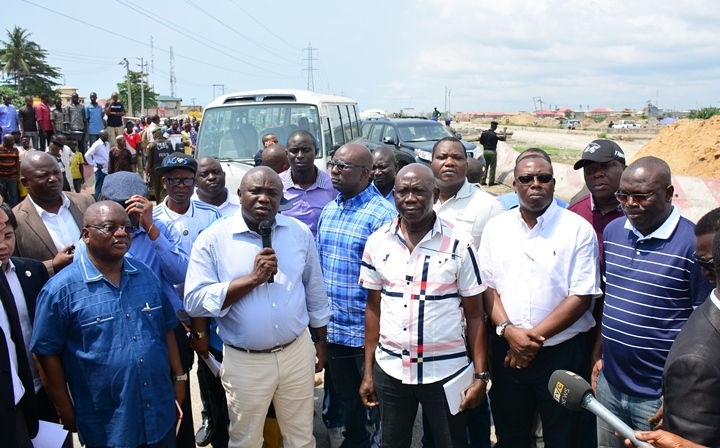 Lagos State Governor, Mr. Akinwunmi Ambode on Thursday assured residents that the ongoing Lagos-Badagry Expressway Expansion project would be completed before the end of 2019. The Governor, who spoke shortly after embarking on extensive inspection of ongoing projects across the State, said the project was a major economic catalyst for Lagos and therefore his administration was totally committed to seeing it through. L-R: Lagos State Governor, Mr. Akinwunmi Ambode (2nd left); Commissioner for Works & Infrastructure, Engr. Ganiyu Johnson; Commissioner for Urban Development & Physical Planning counterpart, Tpl. Waisu Anifowose; Commissioner for Housing, Mr. Gbolahan Lawal; Commissioner for Special Duties & Inter-governmental Relations, Mr. Oluseye Oladejo and others during the Governor’s inspection of Fin-Niger Bus stop, Alakija in Oriade LCDA on Thursday, November 3, 2016. 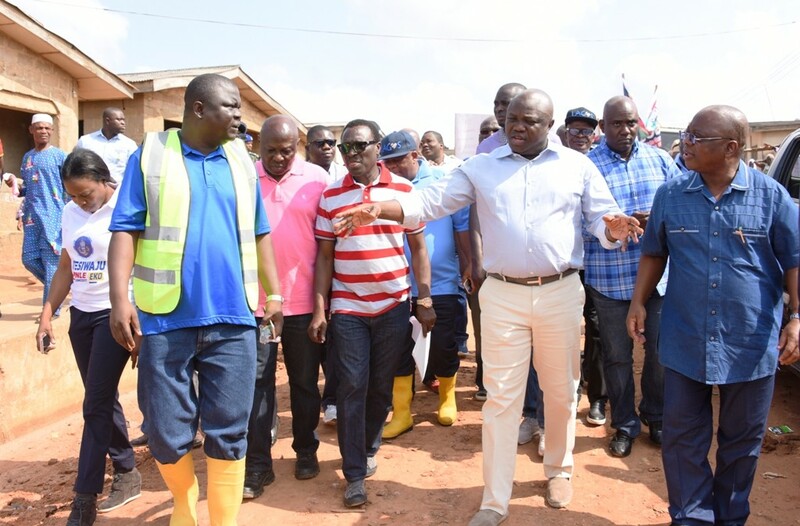 Recalling that his recent visit to Denmark was to finalise plans with APM Terminals to fast-track the commencement of work on the $2.6billion Badagry Deep Sea Port, Governor Ambode said it was important for the road network to be completed within schedule to accommodate the anticipated increase in economic activities within the axis. “On the part of government, it is imperative that the project is accelerated and completed on schedule. It is a 10-lane expansion project with a provision for rail,” he said. Governor Ambode said that though the project was awarded to Okokomaiko, his administration was almost at financial close to give it to a concessionaire who is expected to extend the project from Okokomaiko to Seme Border. 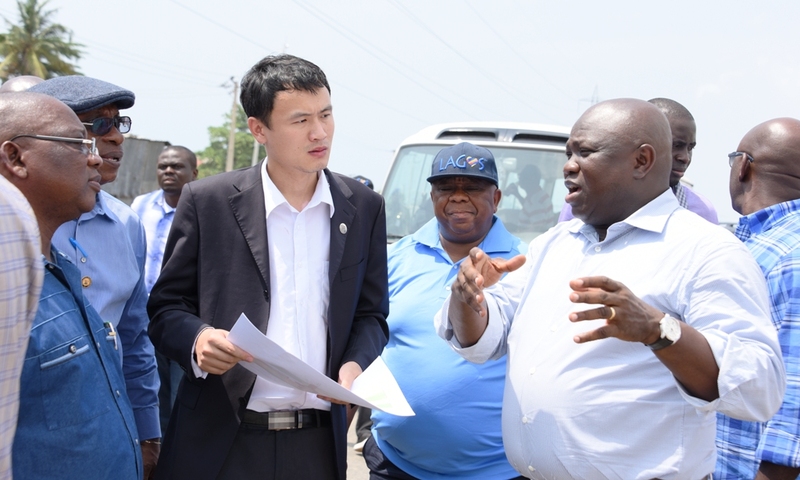 R-L: Lagos State Governor, Mr. Akinwunmi Ambode; Commissioner for the Environment, Dr. Babatunde Adejare; CCECC South-West Manager, Mr. Guan Shuai; Permanent Secretary, Ministry of Works & Infrastructure, Engr. Ajibade Caster Bade-Adebowale and Commissioner for Works & Infrastructure, Engr. Ganiyu Johnson during the Governor’s inspection of Fin-Niger Bus stop, Alakija in Oriade LCDA on Thursday, November 3, 2016. “We believe strongly that the contractor has done a good job here. We have given him the right of way and it is our belief that the one that has been awarded should be completed on schedule. I am committed to this project; I am committed to the expansion of the economy of the East axis of Lagos. That is the surest way to go. “By doing this project, we would also expand the real estate value of this axis and the tourism potentials of the Badagry axis. I am confident that in no time, we should have a complete project before the end of 2019,” he said. R-L: Lagos State Governor, Mr. Akinwunmi Ambode (2nd right), with Commissioner for Housing, Mr. Gbolahan Lawal; Commissioner for Works & Infrastructure, Engr. Ganiyu Johnson (middle); Special Adviser, Finance & Audit Control, Mr. Adeniyi Popoola and Commissioner for the Environment, Dr. Babatunde Adejare during the Governor’s inspection of Irede Road, Abule Osun in Oriade LCDA on Thursday, November 3, 2016. 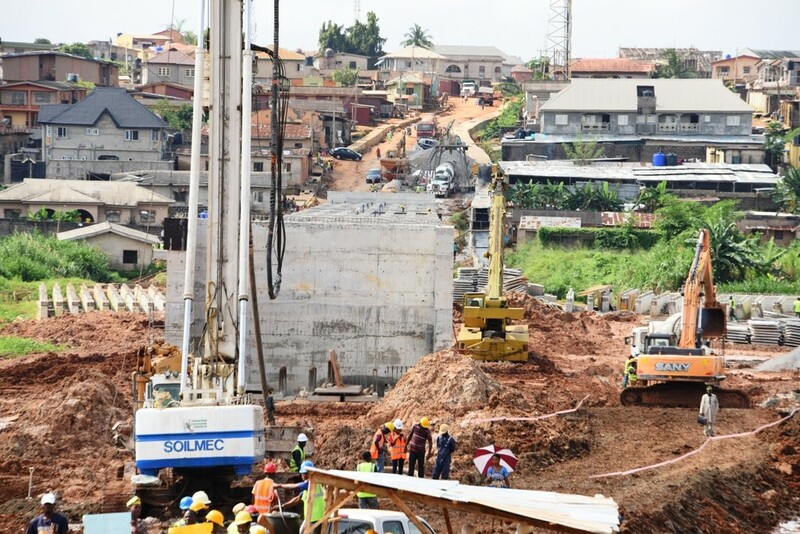 Explaining the progress of work done so far, General Manager of Chinese Civil Engineering Construction Company (CCECC), South West, Mr. Guan Shuai, said extensive work had been done on three Flyovers and Interchange Bridges in Alaba, Agboju and Alakija. He noted that the challenge of relocating pipes and cables belonging to the Nigeria National Petroleum Corporation (NNPC) which hitherto slowed down the project had been resolved through the intervention of Governor Ambode. Cross view of the ongoing construction of Aboru-Abesan LinkBridge, inspected by Governor Ambode, on Thursday, November 3, 2016. 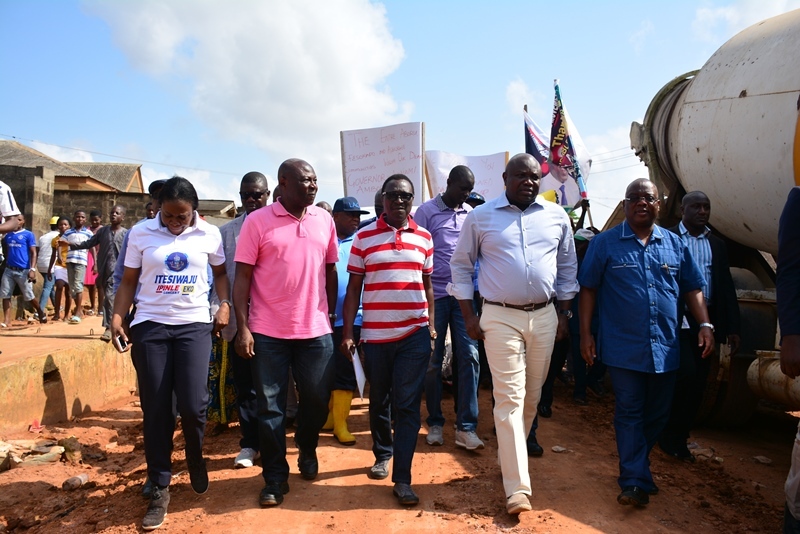 While inspecting the stretch of link road from Agbelekale off Ekoro Road to Abesan Estate via Church Street, Giwa and Aboru, Governor Ambode expressed satisfaction with the progress of the project so far, but charged the contractor and supervisors to ensure the delivery of the project within the first quarter of 2017. The Governor, who was received amidst fanfare by residents who displayed placard of various inscriptions commending him for the project, said the bridge being constructed as part of the project had to be extended from 240meters to 360meters due to the nature of soil in the area. Lagos State Governor, Mr. Akinwunmi Ambode (2nd right), discussing with Commissioner for Works & Infrastructure, Engr. Ganiyu Johnson (right) and Chairman, Laralek Ultimate Construction Limited, Mr. Lekan Adebiyi (2nd left) during the Governor’s inspection of the ongoing construction ofChurch Road, Agbelekale; Giwa Street and Aboru-Abesan Link Road in Agbado Oke-Odo LCDA, on Thursday, November 3, 2016. With them are Special Adviser/ C.E.O, Lagos State Public Works Corporation (LSPWC), Engr. Ayotunde Sodeinde (3rd right); Commissioner for Waterfront Infrastructure Development, Engr. Adebowale Akinsanya (3rd left) and Special Adviser, Urban Development, Mrs. Yetunde Onabule (left). He said: “Just about five months ago, we were here to see the progress of this project. This road is designed to connect all the people living in the Aboru area to Iyana-Ipaja and also to the LASU-Iba road and all the people living within the Ajasa Community. You will recall also that just about three months ago, we were here to open up the Ajasa Command road and this is another project to complement the opening up of the Alimosho community. “Like the contractor has promised, we hope to finish this project by the end of January next year. We have also found out that we need to extend this bridge by an additional 120 meters because of the nature of the soil in this area. I had earlier promised that this project would be delivered by the end of this year but I’m pleased with the progress being made on this project. I want to urge the contractors and the supervisors to ensure that we meet the completion date and that within the first quarter of next year, all the people in Alimosho will enjoy this facility,” he said. R-L: Lagos State Governor, Mr. Akinwunmi Ambode (2nd right), with Commissioner for Works & Infrastructure, Engr. Ganiyu Johnson; Special Adviser/ C.E.O, Lagos State Public Works Corporation (LSPWC), Engr. Ayotunde Sodeinde; Commissioner for Waterfront Infrastructure Development, Engr. Adebowale Akinsanya and Special Adviser, Urban Development, Mrs. Yetunde Onabule during the Governor’s inspection of the ongoing construction of Church Road, Agbelekale; Giwa Street and Aboru-Abesan Link Road in Agbado Oke-Odo LCDA, on Thursday, November 3, 2016. 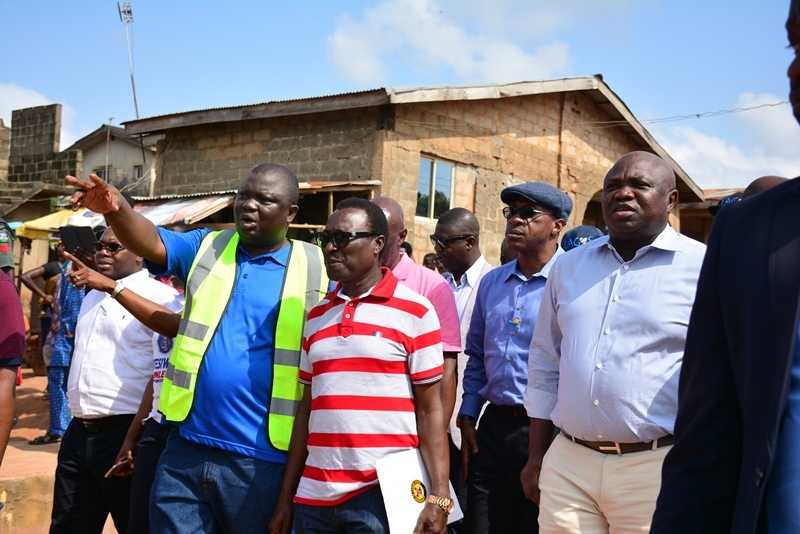 At Irede Road in Oriade Local Council Development Area (LCDA), Governor Ambode was briefed by the Commissioners for Works and Infrastructure, Engr. Ganiyu Johnson and Housing, Mr. Gbolahan Lawal, who narrated the inter-ministerial work being planned for the axis. Lawal said a 30 hectare land at Ado Trade Fair had already been designated for a 500 Housing Units which would be constructed in partnership with the private sector. R-L: Lagos State Governor, Mr. Akinwunmi Ambode; Special Adviser/ C.E.O, Lagos State Public Works Corporation (LSPWC), Engr. Ayotunde Sodeinde and Chairman, Laralek Ultimate Construction Limited, Mr. Lekan Adebiyi during the Governor’s inspection of the ongoing construction of Church Road, Agbelekale; Giwa Street and Aboru-Abesan Link Road in Agbado Oke-Odo LCDA, on Thursday, November 3, 2016. He said the project, which is a transit oriented development, would open up the area for economic activities and real estate, adding that it would complement the 13 stations of the Blue Line Rail Project and 10-lane Lagos-Badagry Express road. In his response, Governor Ambode expressed displeasure with the state of Irede Road, assuring that work would start on the road within the next four weeks. He said: “It is very clear that this Irede road is in a very deplorable condition. I have come personally to see it and I have received complaints from people of this community. I also see that the economic value that we stand to benefit from upgrading this road is unquantifiable. “Beyond the fact that we will open up the road to the Lagos Badagry Expressway, we also intend to expand our housing policy and the rent-to-own scheme to this neighbourhood. So, I like to just clearly state that work would commence on Irede Road within the next four weeks,” he said. In Isolo LCDA, Governor Ambode inaugurated Panada/Lafenwa Road, off Mushin Road, in a ceremony attended by the Oba of Isolo, Oba Kabiru Adelaja, All Progressives Congress (APC) Chairman in Lagos State, Chief Henry Oladele Ajomole, party chieftains. The Governor, who was represented by the APC South West Women Leader, Mrs. Kemi Nelson, said that the construction of the roads across the 57 Councils has made the Lagos economy the most viable in the country assuring that no effort would be spared to make life more comfortable for residents. Earlier in her welcome address, Sole Administrator of the Council, Hon. Abimbola Osikoya, thanked the governor for the promise kept in the construction of the road, noting that the road had been unmotorable and would no doubt improve the economical pursuit of the residents of the area, especially because of its proximity to the popular Aswani Market. At the inauguration of Olorunfunmi Street in Oworonsoki and Okeowo-Somorin Street in Ifako-Gbagada, both in Kosofe LG, the Governor said the selection of 89 local contractors to execute the project was a deliberate strategy to empower the people and stimulate the local economy. The Governor was represented by a member of the House, Hon. Bayo Oshinowo. A House of Representatives member, representing Ikeja Constituency, Hon. James Faleke lauded Governor Ambode’s effort at turning around the face of Lagos. Faleke who spoke at the commissioning of Abiodun Jagun Street and Ishola Bello Street, both in Ojodu LCDA, where he represented the Governor. “We cannot help but commend the efforts of our astute governor in this state. Governor Ambode has demonstrated that he is a man who thinks outside the box. He has been able to make judicious use of funds even in these very trying times,” Faleke said. In Ikeja Local Government, Governor Ambode who inaugurated Onilekere Street, where he was represented by Iyaloja- General, Folashade Tinubu-Ojo, said Lagosians should expect nothing but a better and safer Lagos in the next three years. During the commissioning of the road in Olu Akerele Street, also in Ikeja LG, former Speaker of the Lagos State House of Assembly, Adeyemi Ikuforiji lauded Governor Ambode’s administration for taking the dividends of democracy to the grassroots. At Apapa LG, Governor Ambode through the Commissioner for Waterfront Infrastructure Development, Engr. Ade Akinsanya and a member of the Lagos State House of Assembly representing Apapa Constituency 1, Hon Mojisola Lawal, commissioned 648 meters North Avenue Road and 227meters Caulcrick Road. In his address, Sola Administrator of Apapa Local Government, Mr. Tunde Alao, commended Governor Ambode for the initiative to engage indigenous contractors, describing it as wise economic decision especially in the face of the dwindling rate of Naira against the dollar. Governor Ambode also inaugurated Jinadu Street and Folawiyo Bankole Street in Itire-Ikate LCDA and was represented by Senator Tokunbo Afikuyomi. 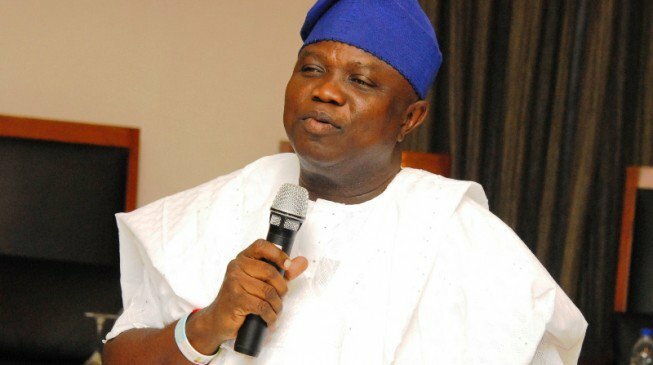 Lagos State Governor, Mr. Akinwunmi Ambode on Friday said plans are afoot to link inner roads in the State to the Lagos Smart City Project, just as he expressed readiness to commence deployment of Close Circuit Television (CCTV) Cameras in October across the State. 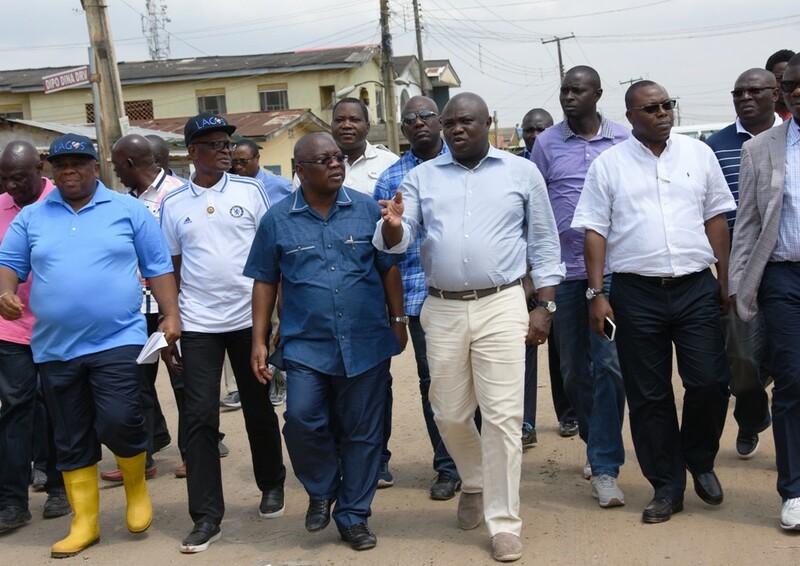 Governor Ambode, who disclosed this in Coker Aguda area of the State at the commissioning of some of the 114 roads, newly constructed in the 20 Local Government Areas (LGs) and 37 Local Council Development Areas (LCDAs), said Government will complement the project with strategic security management driven by technology. The Governor, who was represented by the Commissioner for Science and Technology, Mr. Olufemi Odubiyi at the commissioning of 500meters Bolaji Banwo Street in Coker Aguda LCDA, said security remained one of the cardinal objectives of his administration, and that technology will play a key role in securing residents. Also in Coker Aguda LCDA, Governor Ambode commissioned 580meters Opere Street through a member of the Lagos State House of Assembly representing Surulere Constituency 1, Desmond Elliot. Speaking to journalists, the Governor said: “One of the cardinal areas in which we focus on is security in the State and we have realised that the man policing we have in Lagos is not sufficient if you look at the ratio of the policemen that we have to the citizens of the State. “We have come up with an initiative which is an ongoing project and it is called the Smart City Project. In the area of security, we are going to be deploying CCTV Cameras to ensure that when you are sleeping, you have a guaranty that you are being watched. “The present administration is interested in making sure that this city is safe and technology is one of the areas we are looking at by deploying CCTV Cameras which will be linked to our Command and Control Centre in Alausa. We are going to have an eye over Lagos and this is because of the importance this government is paying to security of lives and property,” he said. At the handover of Otolu and Ojuoto/Ajegunle streets in Lekki LCDA, Governor Ambode said good road network remains a veritable tool for economic prosperity of any community especially the Lekki Free Trade Zone, just as he assured investors of friendly business climate. The Governor who was represented by the Chairman House Committee on Transportation, Mr Fatai Mojeed and a House of Representatives member, Mr. Gbenga Ashafa, said Lekki community would soon be the greatest generator of Internally Generated Revenue (IGR) for Lagos State with a call on residents to pay their taxes promptly for more dividends of democracy. At the handover of Borno Way, Ebute-Meta in Lagos Mainland LG, the Governor represented by the Secretary to the State Government, (SSG) Mr. Tunji Bello, cautioned against arbitrary cutting of roads and vandalism. He said the government will not take vandalism of public infrastructure lightly, tasking community leaders in the areas where the new roads were built to take custody of the roads. The Governor also commissioned Oloto Road, Ebute-Metta also in Lagos Mainland LG and was represented by Mr Alade Adebayo. In Agboyi-Ketu LCDA, the Governor who spoke through his Chief of Staff, Mr. Olukunle Ojo at the commissioning of Zion Street, said the use of inter lock stones, asphalt and concrete to construct roads by local companies was an indication that the era of foreign construction companies in Nigeria was nearing its end. Likewise, at the inauguration of Adedoyin Street also in Agboyi-Ketu, the Governor who was represented by his Special Adviser on Food Security, Mr. Ganiu Sanni lauded the quality of work done, saying it was up to standard. Watch Tower and Imam Salisu Street in Imota LCDA were also inaugurated by the Governor through his representatives, Hon Sanai Agunbiade of the Lagos State House of Assembly and HRH the Ranodu of Imota, Oba Ajibade Bakare Agoro, with a call on residents to put the facilities provided by the Government to judicious use. In Badagry LG, Governor Ambode who inaugurated Hunwi Tande Road, Ajara and Hundeyin Street where he was represented by his Special Advisers on Environment, Hon. Babatunde Hunpe and Transport, Prince Anofi Elegushi said his administration would not neglect any community within the state. In Oto-Awori LCDA, the Governor who was represented by his Deputy, Dr. Mrs. Oluranti Adebule, at the inauguration of Babalola Ilogbo Okeagbo Road, said his administration will continue to carry out people-oriented projects to make life more comfortable for Lagosians. Governor Ambode also inaugurated Goriola Oseni Street and Mosafejo/Ilufe Road in Ojo LG, and was represented by Mr. Ebenezer Kuponu of the Ojo Community Development Council (CDC) and Prince Rabiu Adio-Oluwa, a chieftain of the All Progressives Congress (APC). Similarly, the Governor also commissioned Sotunde and Omodunni Street in Agbado-Okeodo LCDA and was represented by a member of the House of Assembly, Hon. Yinka Ogundimu and his Special Adviser on Civic Engagement, Hon. Kehinde Joseph. Kayode Street and Odebiyi/Dosumu Street, both in Ifako-Ijaiye LG were commissioned by a member of the House of Assembly, Hon. Rasheed Makinde and the Special Adviser to the Governor on Commerce, Hon. Adeyemi Olabinjo as representatives of the Governor. The sound and sight of Lagos will on Monday dominate the popular Notting Hill Carnival in London as the #LoveLagosWeekend campaign enters Day three. To this end, the popular Nigerian Corner on Adelaja street at Notting Hill carnival will transform to Lagos Corner courtesy of the Lagos branding campaign by the Lagos State Government that has taken the city of London by storm since Saturday. The #LoveLagosWeekend started on Saturday with a town hall meeting and media parley addressed by Lagos State top officials and continued on Saturday evening at I Laugh with MC Abbey and the Love Lagos Crack Ya Ribs with Julius Agu on Sunday. Promoter of the Lagos Corner, Mr. Ayo Sonaiya said that Monday’s event coincides with the Notting Hill Carnival’s 50th edition. “We are happy that at a time that Lagos State is counting down to its 50th anniversary, the administration of Governor Akinwunmi Ambode is using the huge platform of Notting Hill Carnival, which is also celebrating its 50th edition this year to reach out to millions of Nigerians and Lagosians in particular about the emerging powerful brand that Lagos has become in the areas of arts and entertainment and in connecting with the Diaspora about the great things being recorded in Lagos,” he said. The Lagos Corner will provide a veritable platform for performing artistes from Lagos State to showcase their talents and further give verve to Brand Lagos as the home of creativity. 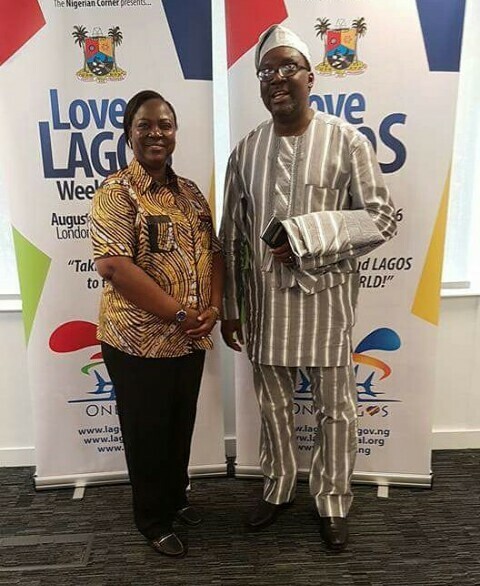 The Love Lagos Weekend, according to the State’s Commissioner for Information and Strategy, Mr. Steve Ayorinde, is a three-day event designed to communicate the Lagos tourism brand initiative to the world. 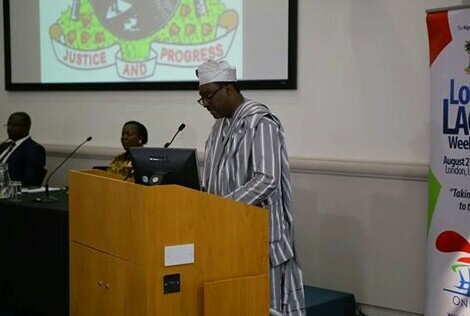 He added that the Love Lagos Weekend in London was also in sync with the government’s plan to celebrate Lagos on the 27th day of every month till May 27, 2017 when Lagos will celebrate its 50th anniversary as a state. “London and Lagos have a long rich history and choosing to start the global brand awareness campaign for Lagos in London is the right thing to do given the huge number of Lagosians and Friends of Lagos that reside and work there, ” the commissioner stated. The Love Lagos Weekend was also geared towards selling the state and uniting lovers of Lagos in the diaspora. Other objectives of the Love Lagos Weekend are to create awareness on the new Lagos State administration, provide platform for interaction with Lagos State indigenes and lovers of Lagos State in the Diaspora and further market the state to potential investors and partners that can contribute towards the Lagos@50 celebrations. 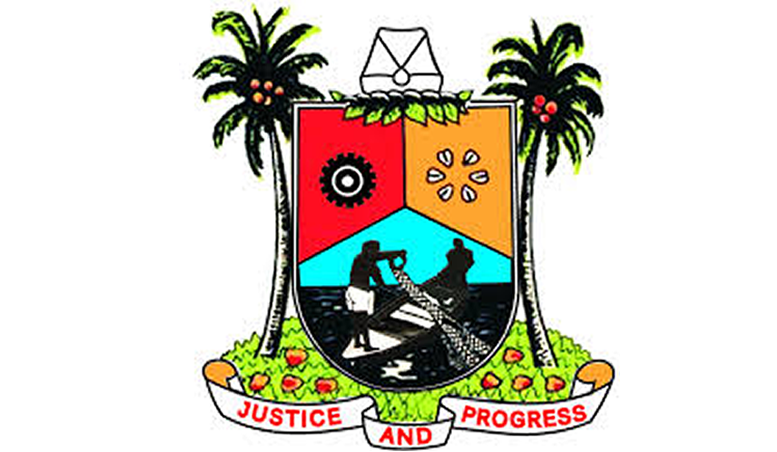 The Lagos State Government has announced its readiness to publicise “Brand Lagos” as the State continues to record successes in infrastructural development, investment drive and promotion of Arts and Culture. 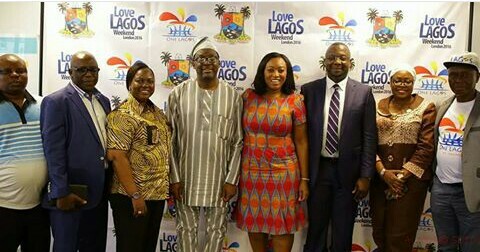 Consequently, the State will expand on its promotion of the State’s tourism brand next weekend with a three-day programme tagged “Love Lagos Weekend” holding between Saturday, August 27 and Monday, August 29, 2016 in London. The State’s Commissioner for Information and Strategy, Mr. Steve Ayorinde, made this known on Friday while receiving the Founder and Chief Executive Officer of the London–based BEN TV, Dr. Alistair Soyode, who paid him a courtesy visit in his office. The Commissioner stated that the time is now right to begin to promote the Lagos Brand on the world stage in order to showcase the socio-economic and cultural strengths of the State. 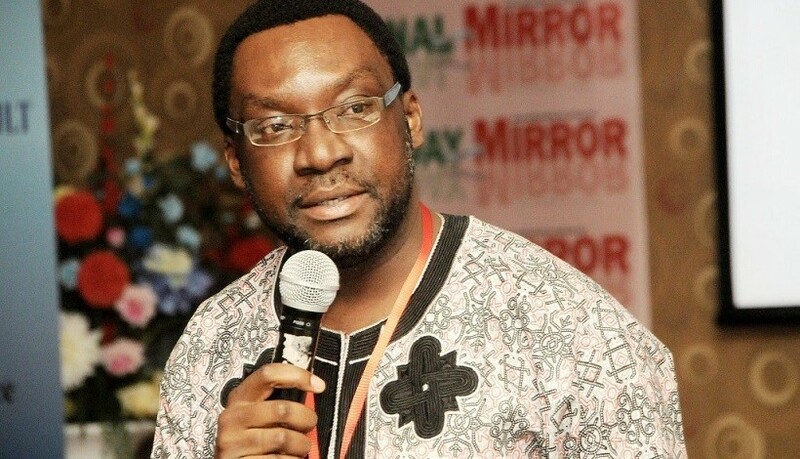 According to him, the State Government has in the past one year undertaken several tourism programmes that have been widely acknowledged, which have put the state on world map, adding that the “Love Lagos Weekend in London’’ is also geared towards selling the state and uniting lovers of Lagos in the diaspora. The various tourism programmes, he said, are in the realization of the pledge made by Governor Akinwunmi Ambode during his electioneering campaign to use tourism and the arts to promote social cohesion and create employment opportunities. The Commissioner congratulated the Chief Executive Officer of BEN TV for the successes recorded in the past 13 years of operation and for propagating the Nigerian and African culture to global audiences. Ayorinde stated that the State Government is ready to partner with the TV Station in line with its strategic engagement with the media. 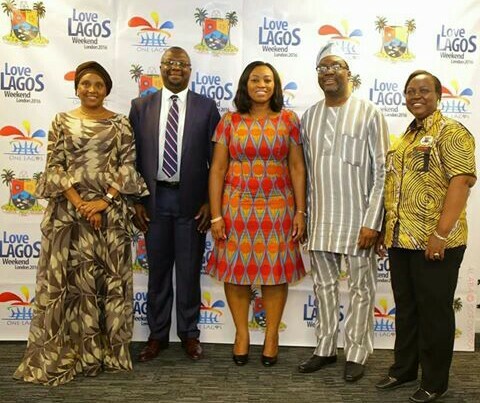 He added that while “One Lagos” had successfully been launched as the state’s Tourism master brand, the ‘Love Lagos’ concept as the slogan and brand-driver is now being promoted to further endear the state to the world. Earlier, Soyode had explained that the purpose of his visit was to intimate the Lagos State government on the activities of the station and the establishment of the ‘’Nigerian Diaspora Mentoring Corp’’ aimed at creating a platform to engage Nigerian youth for gainful ventures. According to him, the Corp has been able to provide a platform to engage professional Diaspora Nigerians to interact with the Nigerian youth for purposeful direction in adjusting to adulthood, noting that private individuals are more available to render such support and give them needed leadership direction. He commended the State Government for redefining public sector information management under the current leadership of the Ministry of Information and Strategy and pledged the readiness of the station to partner with it.